Not sure how many carbs you should eat before and after your workout? Synch the answer to your schedule with this complete guide to carb types and timing! Carbohydrates, sometimes referred to as "the devil," "instant fat gain," or simply "carbs," are a source of heated debate in the fitness world, especially when talking about their role in building muscle or burning fat. With all the charged opinion about whether you should eat carbs—at all, only at certain times, or only from specific sources—it's no wonder so many people are carb-confused! Carbohydrates are important for workout performance, but not all carbs are created equal, and some carbs are better at certain times than others. If this sounds complicated, don't worry! 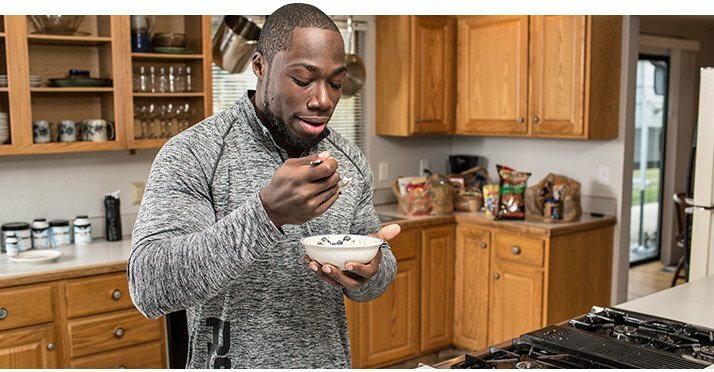 This simple guide will walk you through what to eat before, during, and after your training sessions for maximum performance. There are two types of carbohydrate: simple and complex, and they can each be used at different times to enhance your training and results. Simple carbohydrates provide a source of instant energy without much of a nutritive benefit. Other names you may hear associated with simple carbohydrates include high-glycemic index (GI) carbs, monosaccharides, low-fiber carbs, and sugar. Common examples include dextrose, maltodextrin, sports drinks, pretzels, white rice, white bread, and sugary candies. Common examples include dextrose, maltodextrin, sports drinks, pretzels, white rice, white bread, and sugary candies. Complex carbohydrates provide a much slower release of energy due to their larger size and high fiber content. Other names you may hear associated with complex carbohydrates include low-GI carbs, starch, or high fiber. Common examples include oatmeal, brown rice, whole-grain bread, whole-grain tortillas and popcorn (minus all of the butter!). The type and amount of carbohydrates you consume have a major impact on your ability to perform and recover. Choose the wrong carbs, or eat too many of them, and you could find yourself too full and sleepy to work out! Sometimes it's easier to eat a few hours before your workout, rather than right before it. If you train in the afternoon or evening and like to make lunch your biggest pre-training meal, this section is for you. Consuming a meal this far ahead of your workout allows you to ingest a lot of fuel, since you have ample time to digest it. Your focus at this meal should be high-fiber carbohydrates like oatmeal or brown rice. Eating simple carbohydrates this far from your training session can cause your energy levels to crash quickly, ultimately crushing your motivation to train. Aim for 0.25-0.5 grams of carbs per pound of body weight, a good starting range that you can tweak until you discover what feels best. For example, a 180-pound male might eat 45-90 grams of carbs 3-4 hours prior to training, while a 140-pound female might eat 35-70 grams. Discovering the best amount for you in this range takes a little experimentation and depends on numerous factors such as nutrition and performance goals, type of training, and the duration of your training session. If you like to eat an hour before you exercise, the trick is finding an ideal blend of food that provides low to moderate fiber content. You can opt for a small portion of a complex carbohydrate, such as a half cup of oats, or choose a moderate amount of a quicker-digesting option, such as wild rice. An hour before training is too late to eat much fiber, and too early to eat simple carbs. Too much fiber immediately before training can leave you feeling like a stuffed muffin instead of a stud muffin. Fast-acting carbohydrates like pretzels or candy this far from training can also leave you feeling sloth-like by the time you get to the gym. If you like to eat an hour before you exercise, the trick is finding an ideal blend of food that provides low to moderate fiber content. You can opt for a small portion of a complex carbohydrate, such as a half cup of oats, or choose a moderate amount of a quicker-digesting option, such as wild rice. Don't forget to add a source of protein with this meal! As you get closer to training, you won't need quite as many carbs—0.25 grams per pound of body weight is a good starting point for further experimentation. At this time, a 180-pound male might have 45 grams of carbs, while a 140-pound female could eat roughly 35 grams. Again, these recommendations are meant to provide a starting point for your own experimentation. Some people may feel better with more or fewer carbs, so don't be afraid to tailor these numbers to your needs. If you feel hungry or slightly tired as you prepare to hit the gym—a common for those who eat 3-4 hours before training—a small snack can help pick you back up! At this point, opt for a simple carbohydrate like dried fruit or a high-carb drink over heavy, solid foods. You'll get a hit of energy faster and minimize the risk of bloating or stomach discomfort during training. Aim for roughly 0.1 grams of carbohydrates per pound of body weight. Remember, choosing a small amount of a high-GI option is key. Our 180-pound male could eat roughly 20 grams just prior to training, while a 140-pound female might have 15 grams. The type of training, duration, and intensity will ultimately dictate if you need to consume carbohydrates during training. Although we rely heavily on carbohydrates as fuel during intense exercise, we do not deplete stores nearly as much as was once thought. The type of training, duration, and intensity will ultimately dictate if you need to consume carbohydrates during training. A typical 60-minute bodybuilding workout probably won't benefit from intra-workout carbohydrate crushing. Have a date with the Stairmaster for 30 minutes? You'll be just fine without carbohydrates. It's common to smash carbohydrates after a tough workout. This is a fine practice, but you may not need as many carbs as you think. If you are only training once per day, you have until your next workout—roughly 24 hours away in most instances—to replenish what you used.5 It's common to gravitate toward high-GI carbohydrates post-workout. Although they may replenish stores faster than a low-GI option, they're not 100 percent necessary, given the long period of time before your next workout. If you do have a second training session scheduled for the evening, however, then choosing high-GI carbohydrates after your first workout will set you up to dominate your next workout better than a low-GI option, due to faster carbohydrate replenishment. Training for maximal performance with low carbohydrate stores may predispose you to early onset fatigue! How many carbs? Shoot for 0.25-0.50 grams of carbohydrates per pound of body weight. How many carbs? Shoot for 0.25-0.50 grams of carbohydrates per pound of body weight. Again, this amount is very individualized and depends on numerous factors such as nutrition and performance goals, type of training, and when you train. The average adult male stores roughly 400 grams of carbohydrates in their muscle tissue.7 If we factor in an average 30 percent depletion from a bodybuilding-style workout, we can assume that 120 grams have been depleted (assuming stores were full beforehand), which is further reason not to inhale a colossal amount of carbohydrates post-workout. Jeukendrup, A. E. (2003). Modulation of carbohydrate and fat utilization by diet, exercise and environment. Biochemical Society Transactions, 31(6), 1270-1273. Gaitanos, G. C., Williams, C., Boobis, L. H., & Brooks, S. (1993). Human muscle metabolism during intermittent maximal exercise. Journal of Applied Physiology, 75(2), 712-719. Green, H., Daub, B. D., Painter, D. C., & Thomson, J. A. (1977). Glycogen depletion patterns during ice hockey performance. Medicine and Science in Sports, 10(4), 289-293. Tsintzas, O., Williams, C., Boobis, L., & Greenhaff, P. (1996). Carbohydrate ingestion and single muscle fiber glycogen metabolism during prolonged running in men. Journal of Applied Physiology, 81(2), 801-809. Ivy, J. L. (1991). Muscle glycogen synthesis before and after exercise. Sports Medicine, 11(1), 6-19. Burke, L. M., Kiens, B., & Ivy, J. L. (2004). Carbohydrates and fat for training and recovery. Journal of Sports Sciences, 22(1), 15-30. Essén, B., & Henriksson, J. (1974). Glycogen content of individual muscle fibres in man. Acta Physiologica Scandinavica, 90(3), 645-647.